Speakers: Chacko Daniel and Deep Kapur. This is a true dev session … but I’m here and I haven’t written an original line of programming since 1998. Why am I here? Because Service Fabric is cool and it fascinates me. If I wrote code, Service Fabric (along with functions for atomic trigger/action pieces and app services for interface) would be my choice. 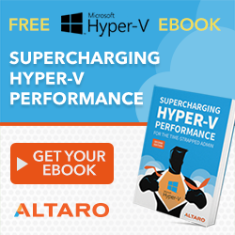 Used for Azure SQL, Power BI, Cosmos DB, IoT Hub, Event Hub, Skype, Cortana, and more. Inventory Manager takes your input. Cluster allocator finds resources to run your code. An app runs on a SF cluster. Each app is made up of 1+ services. A service can be made HA by running it on many nodes in the SF cluster (replicas or load balanced). There is a mesh application resource. In the summary we see the services that make up the app, and how many replicas there are of each service. He opnes one service and we see the replica(s), numbered normally as 0,1,2,etc. The status shows a summary of recent events. In Details we see the physical consumption of the service, the ports (endpoints) it listens to, environment variables. In Logs we can see a screen output of app log data. Simple declarative way to define an application. It’s a way of connecting the outside world, Internet or another network you own, to the isolated network of the SF cluster. This is a service fabric gateway, not a VNet gateway. Inline is in the public preview today, e.g. connection strings. Secrets by reference (key vault) is coming. General purpose file storage.The container can attach volumes. Read and write files using normal disk I/O file APIs. Backed by Azure File storage or Service Fabric volume disk. The SF volume disk is on the cluster and is faster – it is replicated to nodes where your service has a replica (stateful service). Backend: .NET Core and Node.js. Work gets dropped into a queue. 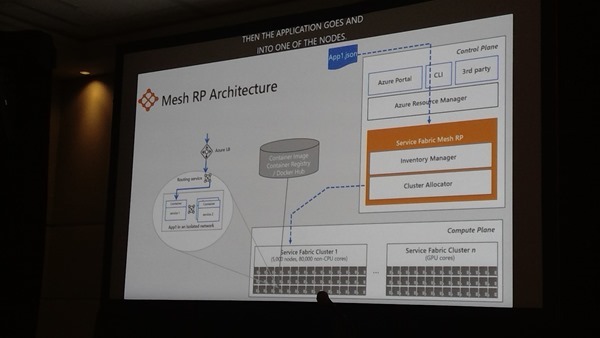 They show us a JSON that is used to deploy the SF mesh application: Microsoft.ServiceFabricMesh/applications. Azure Files is being used as file storage. Secrets are being stored inline. A volume disk is also being used for file storage and they define a mount path in the Linux containers of /app/data. There are front end (1), backend (2) and worker services (3) in the application. 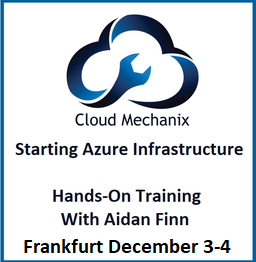 He uses on-PC Azure CLI (PowerShell also available) to push a code upgrade to the SF application. Services talk to each other inside the application by hostname. Not not deal with network level details. Reliable collections allow you to persist state with failover. Uses transactional storage. Storage on a network introduces a “cost”, e.g. latency. Low latency storage is often preferred. Dumps a load of pictures of cats & dogs. Worker numbers increase from 1 to 40 in seconds for 3 services (120 containers). The pictures are categorized and tagged on the fly. Costs depend on the region. Container costs are the same in Azure, irrespective of the Azure offering you get them from. So you choose a container offering based on suitability, not price. Volume disk: disk size, Max IOPS/Throughput per disk). Paid for per month. Biller per hour based on: size of the reliable collection and the amount of provisioned IOPS. What they see: Gaming, media sharing, mission critical business SaaS, IoT data processing for millions of devices, low latency storage applications. GA is planned for early next year – probably Build 2019. The preview is free to use. Go live licenses will be given to early adopters.